It’s a book, a Netflix series, and a movement: Tidying Up. 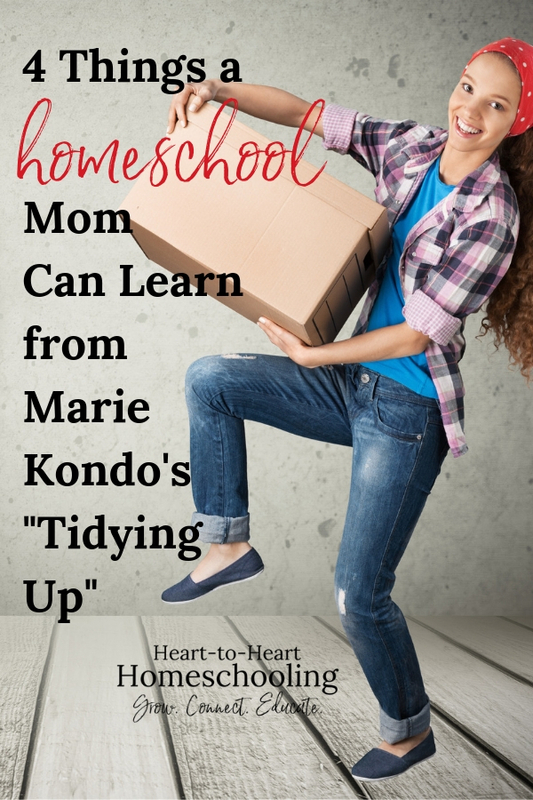 Learn 4 ways you can “tidy up” your homeschool to make it better! At that point I was supposed to thank them for their service and give them away to someone who wasn’t into muffin tops. Both figuratively and literally. But I did learn a lot from sweet Marie . . . The Life Changing Magic of Tidying Up: The Japanese Art of Decluttering and Organizing by Marie Kondo: It’s a book that became a Netflix series that became a “throw-everything-that-doesn’t-bring-me-joy-out” kind of movement. And it makes a lot of sense, at least most of the time. But even if we don’t agree with all of Marie Kondo’s beliefs, we can learn a lot about how to declutter the things we don’t need so we can have a cleaner, more peaceful home. And those principles can be applied to our homeschools as well. Marie teaches her clients to say thank you to the object for its service. Obviously I disagree with this. It’s an object. Our clothes or cooking utensils or even our houses don’t hear or feel our appreciation. But we serve the One who does! Throughout the Bible we see how important it is to be thankful. So if you are are decluttering your home, go ahead and say “thank you.” But say it to our great Provider. When we have an attitude of gratitude, we focus on what we have and not what we don’t have. In our homeschools it helps us to appreciate the uniquely designed children God has given us. It keeps us from spending our time comparing our homeschools to our friend’s. 2. Find what sparks joy. This advice makes me laugh at times. Marie Kondo asks her clients to hold an object in their hands and ask, “Does it spark joy?” when trying to decide whether to keep something or toss it out. My washer and dryer don’t necessarily spark joy, but I am thankful for them (see #1). And I’m pretty sure my husband wouldn’t be good with me decluttering our home by getting rid of them. There are simply things we need. Just like the things around our home that we need, there are subjects and assignments our kids need to work on, even if they aren’t their favorites. But those types of studies can’t be what we do all the time. And often we can even figure out ways to find joy in the things we don’t normally gravitate to by doing them differently. 3. Clean out the clutter. Resources and curriculum. Which ones work the best for my kids? Do I have ones I’ve never actually used? Will I use it, or is it time to sell or bless another family with it? Subjects you study. Do we need to be doing this subject, or are we doing it because “every one else” is (by the way . . . they aren’t!)? If it’s a subject we need to study, do we need to do it every day? Every year? Outside classes and activities. Are our outside classes and activities taking away from our homeschool experience or adding to it? Are we excited about them, or do they cause us to feel stressed or anxious? What good things are we involved in that aren’t the best things for our family? 4. Make sure everything has a place. So if you want to be successful, consider including your children in an organizing project. Ask them to help you find ways that are easy to use and make sense for you as a family. Have a family meeting and talk about the level of neatness you all can agree to. Be inspired by Tidying Up this spring. By taking the time to work through these four areas, you’ll find a calmer, more connected homeschool experience waiting for you. Are You Phoneschooling? How to Overcome Distraction in Your Homeschool 5 Reasons to Homeschool that Will Make You Want to Quit What Would I Do Differently In Our Homeschool?